Nuclear power is the fourth-largest source of electricity in India after thermal, hydroelectric and renewable sources of electricity. As of now India has 20 nuclear reactors in operation in six nuclear power plants, generating 4,780 MW. India's nuclear power industry is undergoing rapid expansion with plans to increase nuclear power output to 64,000 MW by 2032. India's three-stage vision was first set out in the 1950s by the father of the country’s nuclear programme, physicist Homi Bhabha. On returning from his studies at Cambridge University in the UK, Bhabha conceived a nuclear strategy that would work around India’s rather meagre resources of uranium, the fuel powering current commercial reactors. Instead, he sought to exploit the country's vast reserves of thorium, which - if bathed in an external supply of neutrons - can be used a nuclear fuel. 1. First stage by running nuclear reacators with natural uranium fueled by PHWRs (Pressurised Heavy Water Reactors). 2. The second stage involves using Fast Breeded Reactors based on plutonium that will be extracted from the spent fuel of the first stage. 3. Finally, Fast Breeded Reactors based on thorium, which is abundantly available in India to generate electricity. 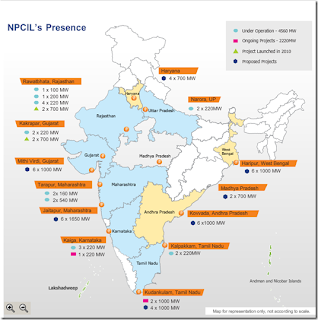 NPCIL is a Public Sector Enterprise Under the administrative control of the Department of Atomic Energy (DAE), Government of India. NPCIL is responsible for design, construction, commissioning and operation of nuclear power reactors. It has also equity participation in BHAVINI, an organization formed for implementation for Fast Breeder Reactors programme in the country. NPCIL is presently operating 20 nuclear power reactors with an installed capacity of 4780 MW. The reactor fleet comprises of two Boiling Water Reactors (BWRs) and eighteen Pressurised Heavy Water Reactors (PHWRs). August 5, 2011: India setting up five nuclear energy parks of 10,000 MW each. These nuclear parks are to be located in Kudankulam in Tamil Nadu, Kovvada in Andhra Pradesh, Haripur in West Bengal, Jaitapur in Maharashtra and Chhaya Mithi Virdi in Gujarat.